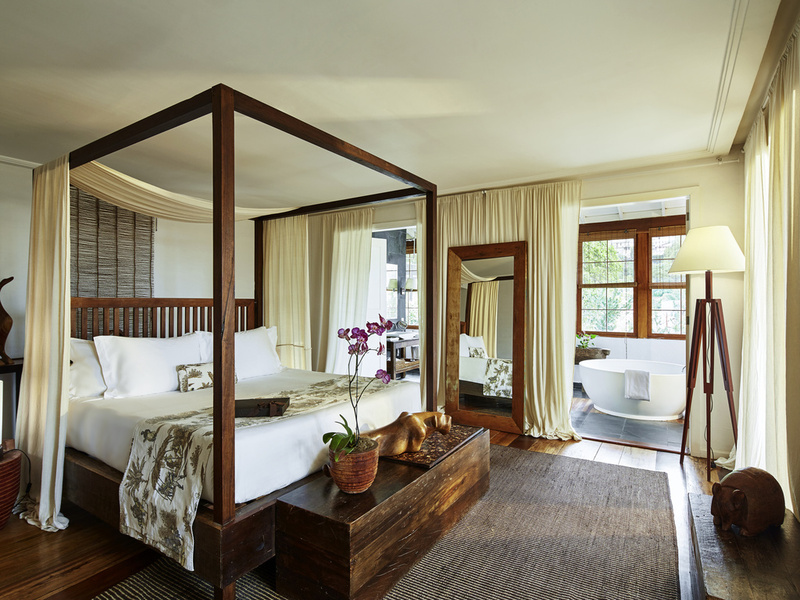 A true oasis of tranquility in the heart of Rio de Janeiro. The Santa Teresa MGallery by Sofitel is located in a charming neighborhood, the heart of bohemian Rio for those seeking an authentic cultural experience. Close to the main tourist attractions in Rio de Janeiro, the hotel is the perfect place for those wanting to visit the city without compromising on a tranquil setting. Welcoming rooms brimming with personality, rustic decor and first-rate products. The well-being experience is completed at our award-winning spa, with options for locals and tourists alike, the charming Bar dos Descasados, a meeting point for the city's residents, and the eclectic Térèze restaurant, serving the best of local cuisine. To round off the experience, a sunset at the side of the pool accompanied by a drink at the heart of the nearby natural wonders. The best option for tourists and locals looking to escape their routine. From its sapphire blue ocean and white sandy beaches to the lush green of the surrounding mountains, Rio reveals a sublime palette of colors. Maracanã, the MAM or the legendary sambadrome invite you to experience the rhythm of this vibrant carioca city. From Santos Dumont Airport, head towards Glória and take Rua Candido Mendes until Largo dos Guimarães. Turn left and stay to the left. The hotel is a 5-minute drive away. From Tom Jobim International Airport take Linha Vermelha towards Zona Sul and take the exit for Leopoldina, São Cristovão and Centro. Take Rua Riachuelo towards Glória, and Rua Candido Mendes until Largo dos Guimarães. Turn left and stay to the left. The hotel is a 5-minute drive away. 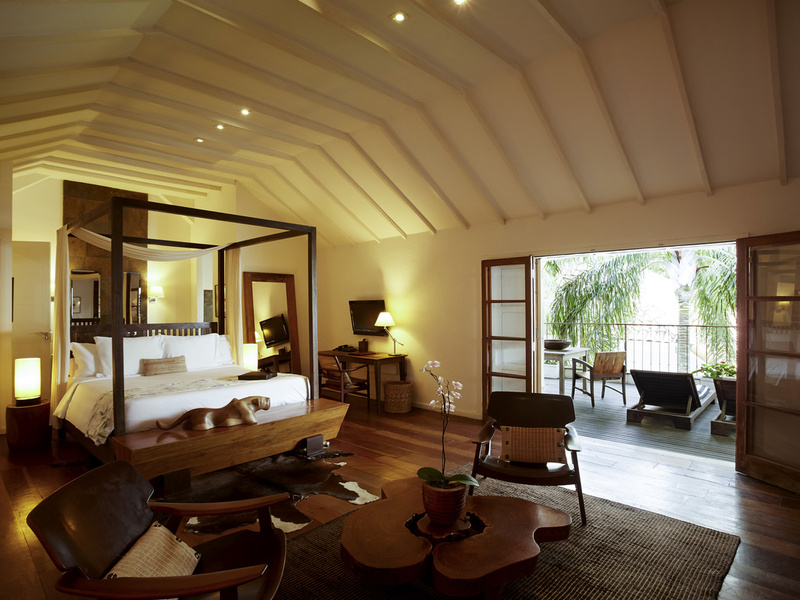 The rooms and suites in the MGallery collection of boutique hotels offer modern comfort in an authentic setting. Suite measuring 431 sq. ft. (40 m²), desk, King Size Bed, bathroom with shower or bathtub, covered balcony. Amenities, hair dryer, minibar, safe, bathrobe, complimentary slippers and two free bottles of imported water at check-in. 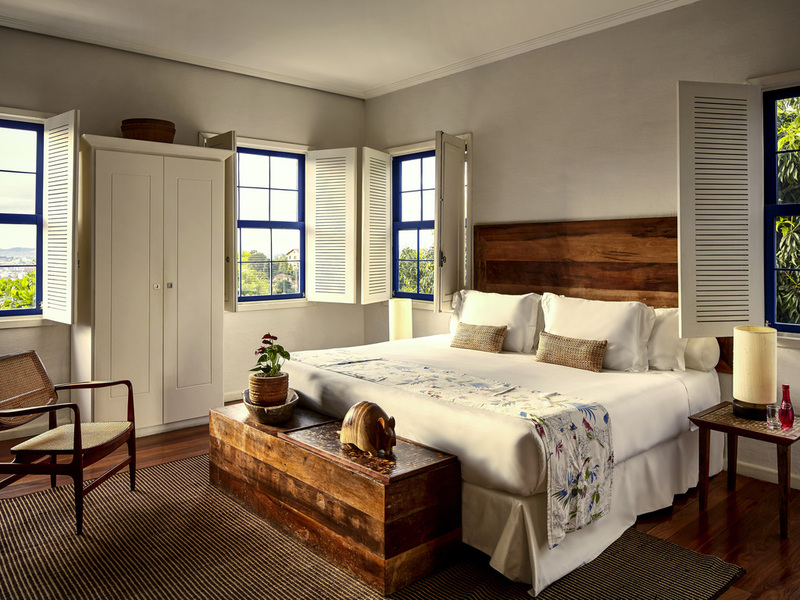 Rustic rooms with decor that reflects the cultural heritage of Rio de Janeiro and all the comfort you need to enjoy your trip, with a bar service included in the daily rate, luxury amenities and complimentary imported water. Rooms measuring approximately 269 sq. ft. (25 m²), with furniture by Rock Lane and Carassas. Views of the hotel gardens or the Santa Teresa neighborhood, a King Size Bed, desk, air conditioning, minibar, safe, WIFI and 27" TV. Rooms measuring approximately 323 sq. ft. (30 m²), with a tropical design and balcony. Views of the hotel gardens or the Santa Teresa neighborhood, a King Size Bed, desk, air conditioning, minibar, safe, WIFI and 27" TV. Suites measuring approximately 700 sq. ft. (65 m²) with views of the hotel gardens. 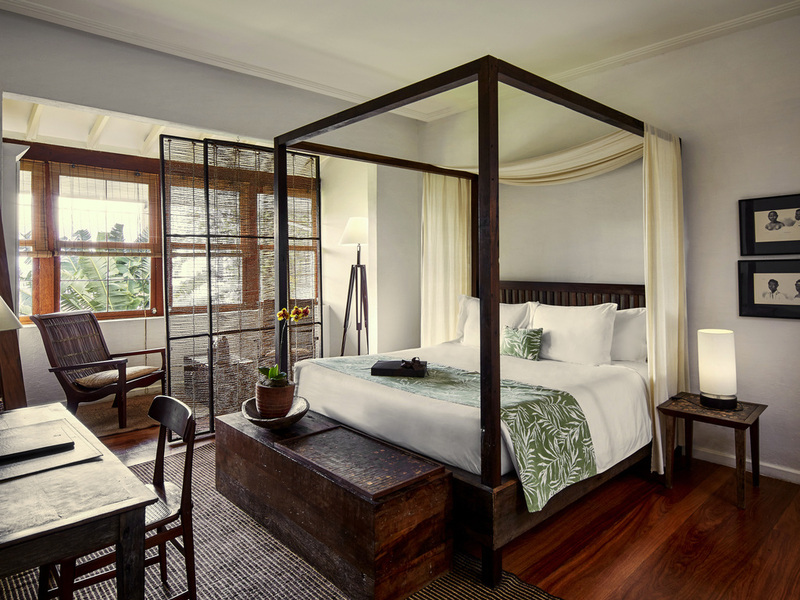 Featuring a tropical design, King Size Bed, desk, bathtub, air conditioning, minibar, safe, WIFI and 27" TV. Suites measuring approximately 753 sq. ft. (70 m²) with views of the hotel gardens. Decorated with pieces by Sergio Rodrigues and featuring a living room, King Size Bed, desk, bathtub, air conditioning, minibar, safe, WIFI and 27" TV. Measuring 1722 sq. ft., with views of Christ the Redeemer and Guanabara Bay. Styled with pieces by renowned Brazilian designers and featuring a living room, grand piano, King Size Bed, bathtub, balcony, air conditioning, minibar, safe, WIFI and 27" TV. The hotels in the MGallery collection know how to tease the taste buds of guests seeking the newest culinary trends or a gourmet adventure. Our bars and restaurants serve traditional and creative dishes in truly authentic environments. In a pleasant and elegant setting with views of Guanabara Bay, Térèze is known for its contemporary Brazilian cuisine. The Bistrô Menu is the ideal option for business lunches. For events, Térèze accommodates up to 100 people. With views of Santa Teresa, the Bar dos Descasados is the perfect place for those looking for a relaxed and cozy setting. Enjoy special drinks and delicious aperitifs. We also cater for business cocktails events, private dinners and weddings. Seminars, conventions, incentive trips... the MGallery collection offers exceptional surroundings for meetings and events. A unique experience and successful event are guaranteed, thanks to the modern facilities provided. 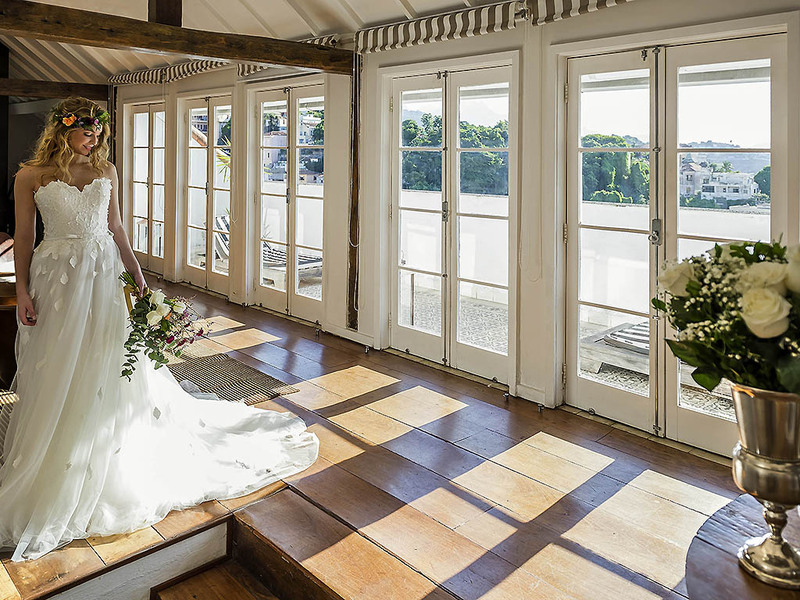 For weddings, civil ceremonies, birthdays or reunions, the hotels in the MGallery collection offer guests a unique experience, in a remarkable setting. Your wedding day is a memorable day where nothing should be left to chance. To make your day a resounding success, the hotels provide the couple with a wedding advisor who will ensure that the ceremony runs smoothly. The terraces, swimming pools and gardens at the boutique hotels in the MGallery collection are the perfect setting for cocktails and receptions. Here, guests will enjoy the beauty of their surroundings. At the end of the big day, both the newly weds and their guests will be very close to their rooms. A honeymoon suite for the bride and groom with a canopy bed... the perfect opportunity for the couple to enjoy this romantic moment to the maximum. Guests will enjoy creative cuisine and dishes prepared using local ingredients. Prepared by great chefs, they will make this occasion even more special and unforgettable. The boutique hotels in the MGallery collection are the perfect place to host wedding ceremonies; both the ceremony and reception can be held in the same location, one of our luxury hotels. Whether for weddings, your wedding night, honeymoon or a romantic celebration, we offer a haven surrounded by natural beauty, with welcoming rooms, first-rate gastronomy and a spa to make your day even more special. Relaxing clay, sauna and ofuro treatments. Transfer and babysitting service on request. Car park and valet parking. Anyone visiting the hotel mustn't forget to take in a sunset by the pool with stunning view of the Marvelous City. Simply choose between the large pool and whirlpool tub and order a drink at the bar to set the scene.